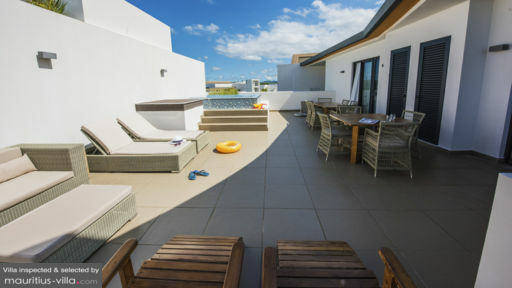 Ideal for larger groups of friends and relatives looking for accommodation in Mauritius, Azuri Penthouse boasts plenty of room where you can lie back and relax as you enjoy the gorgeous weather to the fullest. 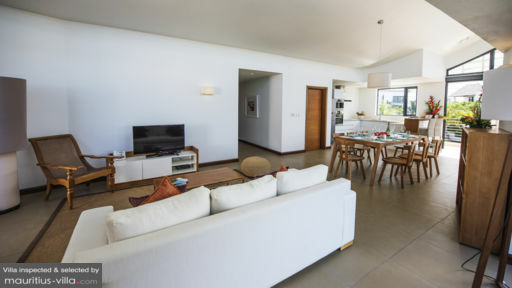 With a royal-like interior, this penthouse places you on the idyllic north coast of the island, close to some of the liveliest attractions in Mauritius. Entirely self-catering, with a plethora of services, ensuring that your holidays go off without a hitch. Best of all, the penthouse offers mesmerizing views of the village or the lagoon, with large windows to let in plenty of sun. With a stay at Azuri Penthouse, you can take your pick from four beautifully-furnished bedrooms, to accommodate up to eight guests. The bedrooms are all air-conditioned and feature plush beds which you can sink into after a busy day. One of the bedrooms even comes with twin beds, perfect for families who are traveling with their kids. The master en-suite bathroom is well-equipped with a glass enclosed shower, sink and mirror with plenty of vanity space for you to get ready in the morning. With a safe where you can keep your valuables, the master bedroom features a four-poster bed and dazzling views of the surroundings. 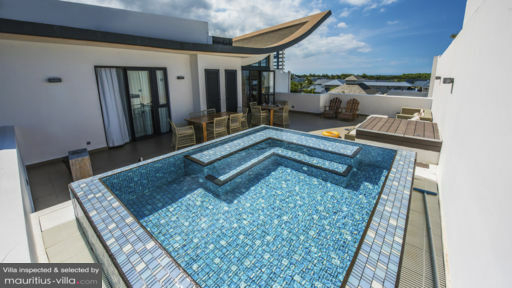 To help you enjoy the beautiful Mauritian weather to the fullest, Azuri Penthouse boasts a deep plunge pool which you can jump into to enjoy a refreshing swim after a busy day. If you don’t feel like swimming laps, you can always relax on your floatie as you gaze up at a blue, unblemished sky. And if you would like to catch some rays, rest assured that the beautifully-manicured garden does include lounge chairs. There’s even a spacious and fully-furnished terrace where you can savor your meals in the great outdoors. Airy, comfortable and radiating with royal-like luxury, the living areas of Azuri Penthouse are perfect for when you don’t feel like going out. The exquisitely cozy living area boasts a deep sense of airiness, opening up to a balcony. This open-plan layout also includes a wooden dining table that can seat up to eight persons. With ceiling fans to shelter you from the island heat, this space also features a flat-screen television, complete with satellite channels. With a stay at Azuri Penthouse, you will also get the chance to work on your culinary skills, thanks to the well-appointed kitchen which includes a full-size refrigerator with water dispenser, island bar and counter chairs. Azuri Penthouse offers different services so you don’t have to worry about a single thing- other than getting some much-needed rest! Thanks to the complimentary housekeeping services, you don’t even have to worry about cleaning up about yourself. Not only is the resort manager on site, but you can also consult the concierge to make various types of reservations around Mauritius. Upon arrival, you will receive a free welcome pack with mineral water, body lotion, shower gel, soap, shampoo, bin liners, olive oil, toilet paper and more. At an extra cost, additional perks such as an in-house chef or in-house massages can be arranged. A short drive from the villa is found the sunny fisherman village of Trou aux Biches, where you can enjoy an idyllic afternoon stroll by the beach. If you want to enjoy a more vibrant atmosphere, you can always head over to Grand Baie, which is reputed for its many nightclubs.